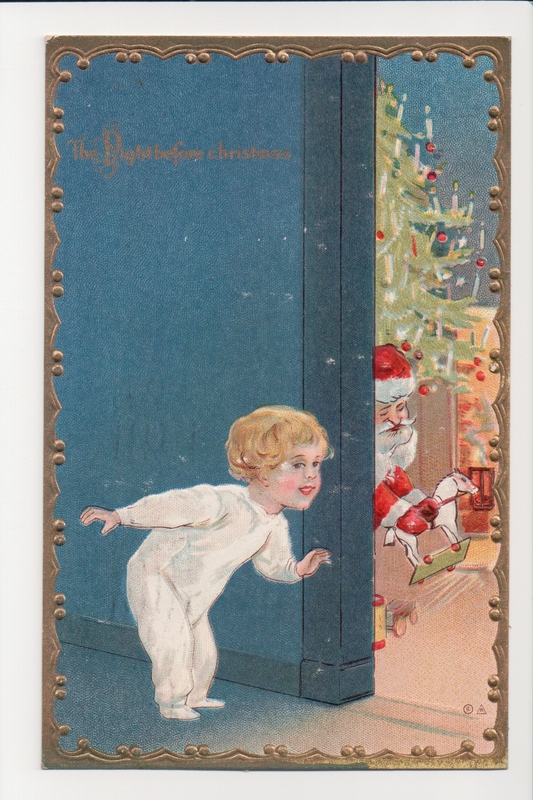 Surname Saturday: The Minor Postcard Advent Calendar, December 18: Sneaking Up On Santa! This fifth day of my Postcard Advent Calendar, a project inspired by Minor Family treasures, I am happy to share this Christmas greeting from seventeen year old Helen Stephenson Minor to her eight year old brother, Donald Corbly. Helen was attending a boarding school in a nearby town. Judging from the postmark, Helen wrote from Waynesburg, Pennsylvania, which makes me wonder if she was not attending Waynesburg College or an affiliated high school. Helen mailed the card December 21, 1910 and would have arrived home in time to celebrate the night before Christmas with young Donald. This card’s vignette is unusual in its story. A tow- headed young child pauses during his clandestine mission. “Do you see what I see,” he asks us. The Christmas tree, adorned with beads, crystals, and balls, sheds its candlelight on the Christmas eve scene. Santa Claus is just around the corner and seems to be playing with the white flocked horse! What a racket Santa must be making as he runs the stead’s wheels across the wood floor! How tempting to our young peeper to just grab the drum and join the fun. But we all know how this night ended–with a scurrying of slippered little feet, back to bed, back to sleep. The publishers information is in some code on the front of the card: a dot in a circle within another circle sits next to an N within a triangle. Both can be found in the lower right corner of the card. On the back are the words “Night Before Christmas Series No. 15.” Any collectors with information? Please leave a comment!! Next Article Postcard Advent Calendar, December 19: Here, Kitty, Kitty!